Dental braces improve your oral health and give you a nice smile. In fact, 4 million people in the US wear braces and 25% of these individuals are adults. You don’t only need good dental braces to position your teeth perfectly, you also need a great flosser that works well with braces. It’s hard to clean some braces. When you chew, your braces may hold on to some particles, and sometimes, the whole chunks of food. Most toothbrushes are not particularly made to clean under braces. So, you need a flosser to help you get the job done. Picking the wrong flosser would lead to the growth of bacteria and teeth problems inside your mouth. The right flosser will ensure that your teeth stay healthy while you use braces. What is the best water flosser for braces? In this review, I reveal five. These five are the best water flossers you need for your braces. Is water flosser safe for dental braces? Very few people can argue that Waterpik ADA Accepted WP-660 Aquarius Water Flosser isn’t the best water flosser for braces today. As indicated in its name, this flosser was awarded the American Dental Association (ADA) Seal of Acceptance. It offers a more effective way to floss your teeth than most other devices out there. Waterpik ADA Accepted WP-660 Aquarius has 10 water pressure settings. These water pressure settings let you control the force of water spray by this flosser. You can start from the lowest pressure setting and move your way up as you get more comfortable with the device. The flosser has 90 seconds water capacity and even more if you choose the lowest water pressure settings. That means you don’t have to refill until after 90 seconds of usage. In case you’re new to flossers, one minute a day is all you need to floss your teeth. The product works pretty fast. With Waterpik ADA Accepted WP-660 Aquarius Flosser, you’ll be able to remove plaque and food that are beyond your toothbrush’s reach in your braces. The product comes with 7 Waterpik Water flossing tips you can use all by yourself or share with others in your household. This Waterpik flosser has a modern design. It has an On or Off switch on the handle. It’s even easy to operate using just your fingers. It comes with a power button that has a LED mode display. It also comes with a 1-minute timer and a 30-second pacer. These take the guesswork out of flossing. If you’re wearing braces, you need a flosser that cleans between your teeth and gives you a nice and healthier gum. It has been clinically proven that Waterpik removes plaque 99.9% of times. Don’t turn on Waterpik WP-660 Aquarius Flosser until it’s in your mouth because it works powerfully. Turning on before putting it inside your mouth means you’ll splash water everywhere. Just like your body, your gum needs a shower too. 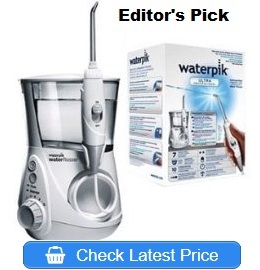 And Waterpik WP-660 flosser gives you that. Most dentists highly recommend Waterpik WP-660 flosser. And the reason why is simple: there are almost zero flossers that can beat the quality you’ll get from this flosser. The only downside of this flosser is that it’s loud. Well, the truth is you want a healthier and nice gum while you use braces. Waterpik WP-660 can give you that. Waterpik WP-900 Complete Water Flosser is more than just a flosser. It gives you more. You’ll be getting a high-quality toothbrush and flosser in a single device. Waterpik WP-900 removes plaque and debris where brushing and traditional flossing can’t reach. 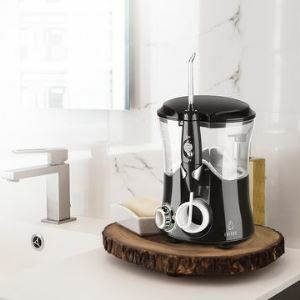 This device has a water capacity that lasts more than 90 seconds and comes with a sonic toothbrush technology that is 25% faster than your normal toothbrush and other sonic toothbrushes. The sonic toothbrush is rechargeable and offers you two speeds, and timing or pacer option. There’s a premium travel case that comes with the package perfectly made for the toothbrush. I recommend Waterpik WP-900 as the best water flosser for braces. With this product, it means both your brushing and flossing needs will be served by one device. When you’re using braces, you want the best dental care you can get. Waterpik WP-900 offers that care. The device is superior to many other flossers you’ll find out there. The product has an advanced ergonomic handle that makes it easy to use and get the job done without complaints. The Waterpik WP-900 is designed for gentle cleaning and maximum plaque removal. The sonic toothbrush with Waterpik WP-900 is 159% better than a manual toothbrush for improving gum health. 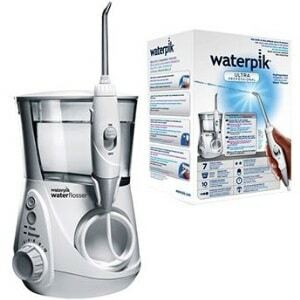 The quality of fresh breath and nice-looking teeth you’ll get make Waterpik WP-900 an indispensable device. 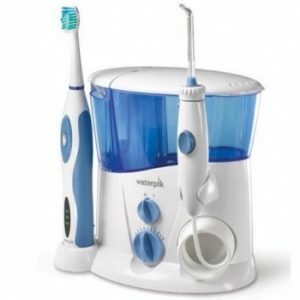 Waterpik WP-900 Complete Care Water Flosser and Sonic Toothbrush is a device you’ll want to continue to use when you stop using braces. You’ll be wrong if you think Waterpik WP-900 Complete Care Water Flosser and Sonic Toothbrush is a device that’s complex to use because it does more. The device is very easy to set up. And did I say that mastering this device takes very little time compared to other flossers? The downside is that you’ll have to buy a new toothbrush from Waterpik when the battery stops holding a charge. But the good news, you can use the battery for at least, 2 years before it stops working. By then, you’ll be excited about getting a new set of flosser and sonic toothbrush from Waterpik. You can buy the brush if you’re not interested in replacing the whole set. PECHAM 600ML Capacity Professional Water Dental Flosser is an ultra-strong flosser that works at a high-pressure water pulse of 1250 – 1700 times per minute. This makes it a powerful water flosser that’s ideal for braces. This flosser will remove food residues and plaque in every corner of your teeth. It doesn’t stop there. Because of its high energy, it prevents tooth decay, gum bleeding, swelling and pain sensitivity due to oral diseases. All these make it the best water flosser for braces. The device comes with seven tips. Adjusting the water pressure of this flosser is easy. You have ten pressure settings to choose from. This is the flosser you can share with your whole family. PECHAM Water Dental Flosser can run up to 90 seconds without interruption. The design of the reservoir is made for fast refilling. The device comes with 12-month replacement warranty to ensure that you’re fully satisfied. The quality of the device is unquestionable as it’s approved by the FDA. Kids love this device. So, if you’re buying this for kids with braces or you intend to share it with kids, you can be sure that they’ll look forward to flossing their teeth with PECHAM. PECHAM Water Dental Flosser is the perfect device for a family because it comes with multiple attachments you can share with other members of your household. It offers 10 water pressure settings. The only downside is that the button of the flosser is a slide and it doesn’t slide easily. It’ll be good if it is a push button rather than a slide. 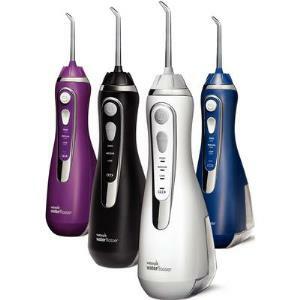 Waterpik Cordless Advanced Water Flosser is the most advanced cordless flosser. Its design is amazingly unique and has a 4-hour magnetic charger. The device has three water pressure control. The pressure options are low, medium and high. You can personalize the pressure to suit your needs. Waterpik Cordless Advanced Water Flosser is waterproof. That means you can use it in a shower without issues. The tip can rotate 360 degrees to reach your entire mouth. The charger is premium. You can use it for a long time without problems. Most cordless water flossers have low-quality chargers which you’ll have to replace a short time after purchase. That’s not the case with Waterpik Cordless Advanced Flosser. Because of its light weight, this flosser is ideal for traveling. It comes with a microfiber travel bag. You don’t have to worry about not flossing your teeth when traveling. For those who are using braces and travel a lot, consider Waterpik Cordless Advanced Water Flosser as the best water flosser for braces for your own needs. Other flossers may not be ideal for you because of their weight. This flosser is light in weight and also gives you a travel bag to put the device in. By using this flosser once every day, you’ll have 100% healthy gum after 14 days of regular use. The reservoir can last up to 45 seconds without interruption. The package comes with four flossing tips. If you use braces and travel a lot, Waterpik Cordless Advanced Water Flosser is the best water flosser you want to use right now. Using no flosser while traveling is bad for your gum health. Save yourself from having a major gum surgery by using this device. It won’t take a lot of space in your travel bag when moving. Waterpik Cordless Advanced Water Flosser gives you zero excuse for not flossing your teeth. When you use braces and don’t floss because you can’t carry a bulky flosser, you risk your dental health. It means your teeth will have plaque and bacteria when you finally get back home. The major con of this flosser is that it has 45 seconds of water capacity. That shouldn’t really be a problem for you because the reservoir has been reduced to make it easy to carry everywhere you go. This flosser will reach anywhere between your teeth and braces. It gives you a deep, better clean than most flossers. Belmint Dental Water Flosser gives you 1,400 pulses per minute. It’s also fully adjustable. Like most high-quality flossers, you have 10 water pressure settings to choose from. As the name suggests, the package comes with three interchangeable nozzles with different colors. So, if you want to share with others in your family, that’s very easy to do. Each nozzle rotates 360 degrees to ensure that every part of your teeth is thoroughly flossed. As an added bonus, Belmint Dental Water Flosser comes with a high-quality tongue scraper. Having your gum cleaned is as important as having your tongue cleaned. You can always contact customer service for a replacement or ask for your money back if you’re not satisfied. There’s absolutely zero risks to you when you buy Belmint Dental Water Flosser. I rate brands that offer money-back guarantee highly because it means they believe that their customers should come first before profits. Belmint is the less-talked-about flosser on this page but it’s better than flossers that are not included on this list. It gives you exactly what you want, which is fresh and clean gum both when do and when you don’t use braces. Your mouth will feel well-cleaned and refreshed if you’re wearing braces. The device ensures that your gum is healthy and there’s no room for bacteria in or around your braces. The flosser takes little space in your bathroom. It also looks shiny and attractive. The reservoir provides 90 seconds of uninterrupted use. 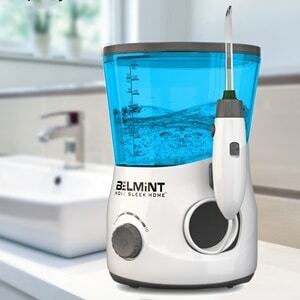 Belmint Dental Water Flosser does the job at a reasonable price. If you’re looking for the best water flosser for braces that isn’t expensive, this flosser is highly recommended for you. It doesn’t leave your gum sore and it makes very little noise when compared to most other flossers. Water flossers are very safe for dental braces. In fact, you need a water flosser when you’re using braces. Using dental braces without flossing can create serious issues like gum disease and cavities. According to a study, people who floss daily have 40% decrease in their risk for cavities. Brush around all parts of your dental braces and all the surfaces of your teeth. But that doesn’t mean your teeth is 100% protected when you wear braces. They’ll still be some plaque around your teeth where your toothbrush can’t reach. Water flossing is the best way to get some plaque out of your teeth. That is why using a water flosser isn’t only safe for your teeth, it also protects your teeth 24/7 when you do and don’t wear braces. Even a sonic toothbrush can’t remove everything. You’ll still need a water flosser. Above I listed the best water flossers available. Pick one and you’ll have the best water flosser for braces that keep your gum and teeth healthy. You can’t just buy any water flosser and expect it to do great work. There are some things you must consider before choosing any water flosser. Before buying a water flosser, make sure it lets you adjust the water pressure by yourself. Water pressure settings let you control the force by which water comes out of the floss. Sometimes, you need a lower force and sometimes higher. There’s nothing like the perfect water pressure. The flosser should let you set pressure to your comfort level. Not all water flossers are made for braces. A high-quality water flosser should come with tips that are perfect for braces. These tips help you remove plaque that is hard to reach. They also help you flush food and debris out of your braces. A perfect water flosser should be easy to use without additional stress. It should be easy to refill the reservoir and a full tank should last 90 seconds for non-portable flossers. It should be easy to switch it on and off. You shouldn’t have to splash water everywhere during use. The timer is the recommended cleaning time set for the flosser. The pacer is the short pause that occurs to let you move to the other half of your mouth. Most flossers have a recommended time of 1 minute. That means the cleaning time is 60 seconds. The pacer is the short pause at 30 seconds that let you move to the other half. A good flosser should have a timer and pacer. Don’t buy a flosser because you saw it in a store and know someone who uses it. In fact, that’s a wrong reason to choose a flosser. Make sure the device is approved and certified by the American Dental Association (ADA). Look for the ADA’s “Seal of Approval” on the package. When you see it, it means the device has been tested and safe for use. As you know by now, flossing is important. However, knowing how to do it right is even more important. Step 1: Fill the reservoir with warm water and make sure it’s rightly positioned back to its place. Step 2: Choose a tip you want to use and fix it into the handle. Step 3: Make sure you select the lowest pressure and lean over the sink. Put the tip in your mouth. Step 4: Turn on the flosser and close your lips to prevent water from splashing everywhere. Water should gently flow into the sink. Step 5: Set the tip along the gumline. (That’s the base of your teeth). Step 6: When you’re done, turn of the flosser. And press the button to remove the tip. Why use water flossers for braces? What are the benefits? There are many benefits attached to using water flossers for braces. Water flossers make you motivated to floss. Very few people floss. Seeing your water flosser right there in your bathroom can help you make it a daily habit. Most water flossers have nice designs that call your attention in the bathroom and they are also fun to use. It’s even more important to use them when you use braces because you need something that really works. You need to clean those braces and ensure that there are no particles hiding in between them. Water flossers are the answer. Just buy one of the best water flossers for braces listed on this page and spray! That way, you don’t need to worry about your gum because your flosser takes care of it. The benefits of using water flossers for braces are so enormous. That is why dentists recommend people with braces floss every single day. You want healthy teeth and gum and you use braces. Yes, your braces will give you a nice smile. In the meantime, you need something to ensure your teeth are 100% healthy while those braces are there. Each water flosser listed above in this review is a high-quality device. Maybe you’ve been wearing braces for some time now and just want to buy a new flosser. Above, I’ve listed the best water flossers that are perfect for your needs. There aren’t any better flossers you’ll find in the market. These flossers were tested and carefully selected to ensure that I provide quality recommendations to readers of this blog. You won’t be disappointed buying those water flossers. Those flossers continue to receive positive reviews and praises from all over the world because they do what you want them to do. Make the right decision by buying one of these flossers. Is Water Flosser Safe For Braces?